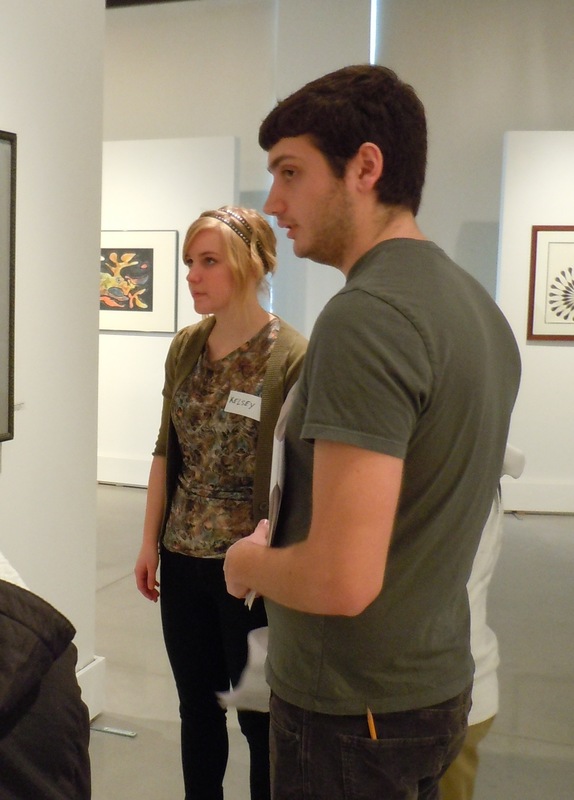 The Art Education major prepares students for a successful career in Art Teaching. Designed to create exemplary artists and educators, the innovative curriculum includes an exciting range of art education, art studio, and art history courses. Field experiences in the sophomore, junior, and senior years offer students unique opportunities to work and teach in actual K-12 New Jersey art classrooms and with local non-profit arts organizations. 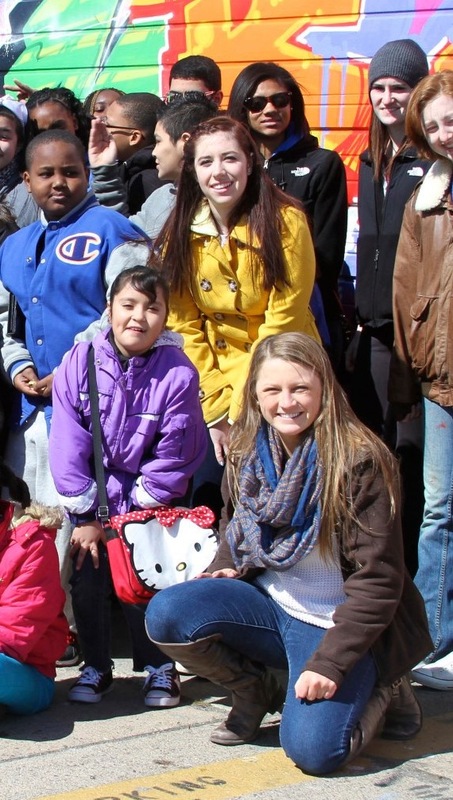 The program culminates with a full semester of student teaching at both the elementary and secondary level, with an option to student teach abroad. 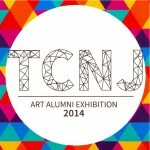 With a reputation for excellence, TCNJ’s art education graduates are represented in school districts and arts organizations across the region. Upon completion of the Bachelor of Arts degree, students qualify for the New Jersey State Art Teacher Certiﬁcation, kindergarten through twelfth grade. Five art education majors have been accepted to the global student teaching program so we will have student teachers placed around the world this fall! Congratulations Melanie Capalbo, Kelly Marrone, Claire McNally, Estefany Rodriguez, and Madeline Wyville! Bon Voyage! Estefany Rodriguez and Shayla Nolan, who co-presented a project “Inside Out: Fabric of Trenton” with Dr. Carolina Blatt-Gross at the Art Educators of New Jersey annual conference in Long Branch, NJ. 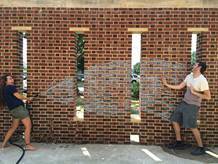 Their presentation detailed two large-scale community-based art projects they recently completed in Trenton and the benefits of Community Based Art Education. 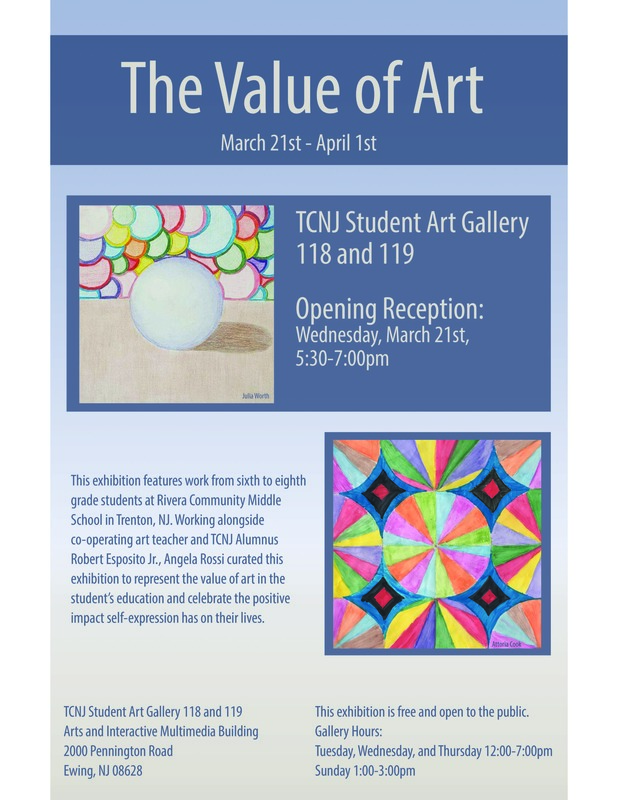 After completing her student teaching at Rivera Community Middle School, in Trenton, NJ, graduating senior Angela Rossi curated an exhibition titled “The Value of Art” featuring her students’ work. The March 2018 reception was attended by Angela’s cooperating teacher and principal as well as many of the student artists represented in the show and their families! 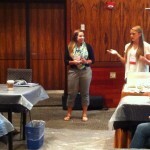 TCNJ was well represented at this year’s AENJ conference, our state professional organization! Presenters included current student, Archana Kamani, who shared an original lesson plan, and recent graduate, Abigail Saiia, who shared tips on transitioning to a new position. In Fall 2015, Taylor Hughes spent half the semester student-teaching abroad in Italy! What a wonderful experience! Amanda Intili and Matthew Pembleton for their 2015 publication titled, “Defying Reality: Performing Re-Imagined Worlds.” The article, co written with Dr. LaJevic, was published in Art Education, the official journal of NAEA. The article explores an engaging lesson inspired by Robin Rhode, a South African contemporary performance artist, that asks students to perform and document intra-actions with static chalk drawn re-imagined worlds. The paper was co-written during MUSE. Matt graduated in December 2013 and Amanda plans to graduate in 2016. Scott Samuels for his 2015 solo show of upcycled works at The Gallery at Don’t Toss It in Lambertville, NJ! Amanda Intili for her proposal acceptance to the 2015 National Art Education Association (NAEA) Convention in New Orleans, LA. The paper titled, “Pre-Service Teaching and Art Workshops for Underserved Populations” was co-written with Professor LaJevic during MUSE 2014. Katelyn Liepins for her 2014 solo art show at TCNJ! Jenn Cartagena, Colleen Duffy, Alyssa Gargiulo, Amanda Intili, Keith Kozak, Susan Mitrano, Matthew Pembleton, and Jessica Sassaman,. These are a few of the students (and recent alumni) who will be presenting at the 2014 Art Educators of New Jersey (AENJ) Conference in Long Branch! Good luck! 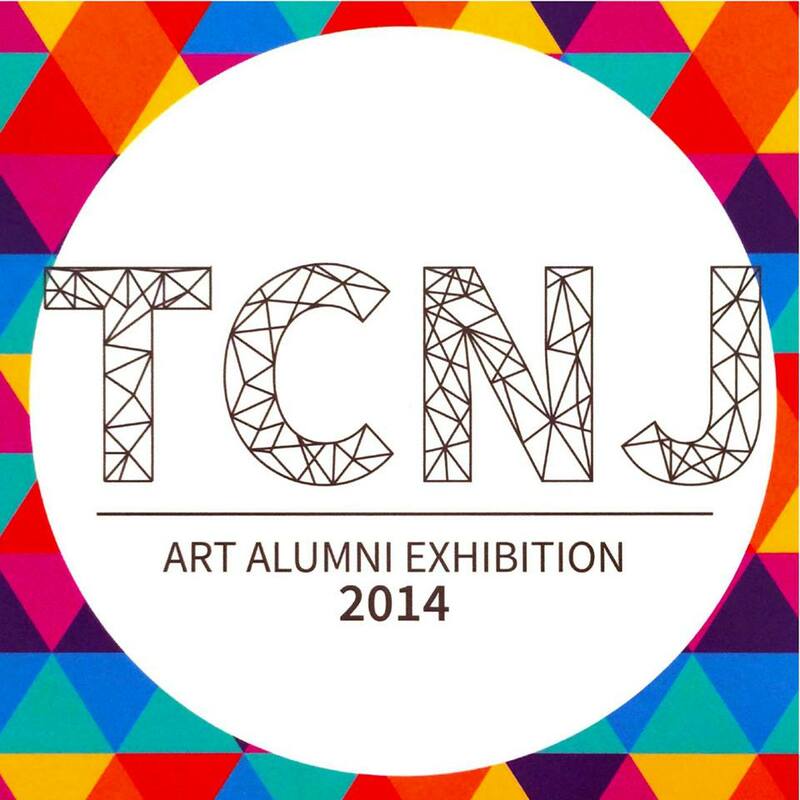 All the AAE Alumni who are showcased in TCNJ’s 2014 Juried Alumni Art Exhibition! Way to go teaching- artists! All the AAE students who graduated in 2013-2014! We are so very proud of you! 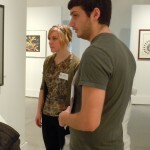 We also want to recognize a few alumni that recently accepted jobs as K-12 art teachers! Samantha Berk is teaching in Cranford, Andrew Dean is teaching in Maplewood, Johann Derflinger accepted a position in Somerville, Allie Guarini accepted a job in Burlington City, Ashley Garguilo is teaching art in the Richmond County Schools, NC, and Jessica Sassaman accepted a position in the Falmouth Public Schools, MA. 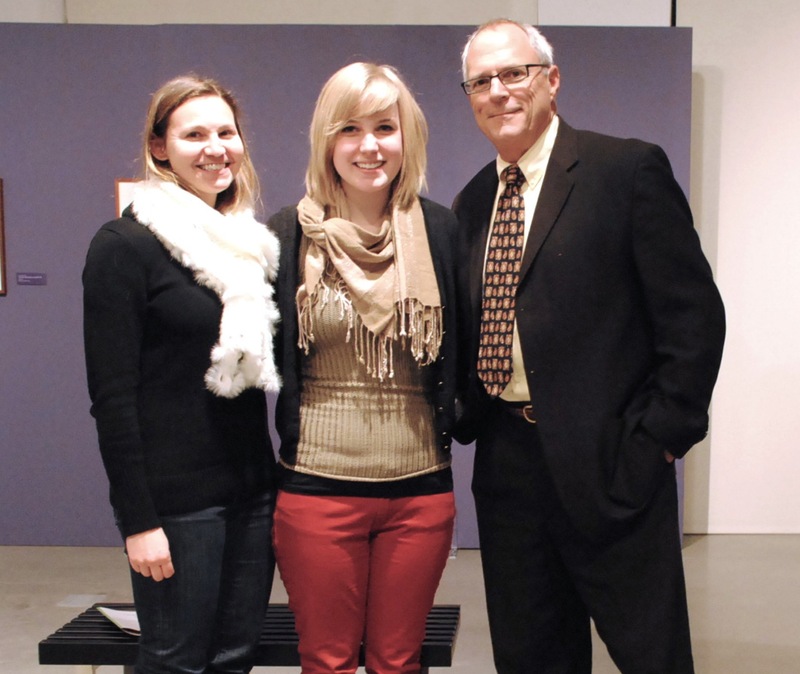 Kelsey Long for receiving NAEA’s 2013 Higher Education Student Achievement Award. Kelsey was chosen as the national recipient for this prestigious award that was bestowed to only one art pre-service teacher in the nation. 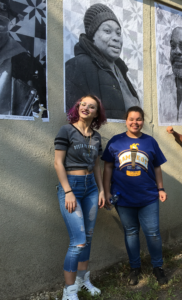 While student-teaching in Spain, she designed a cultural art exchange lesson with an art teacher at Trenton Central High School. Kelsey (2012) is currently teaching art at Academic Charter School in Jersey City. Jessica Sassaman, Alyssa Gargiulo, Jennifer Cartagena, Ashley Garguilo, Samantha Berk, Alexandra Wesson, Johann Derflinger, Colleen Duffy and Emily Pustay. 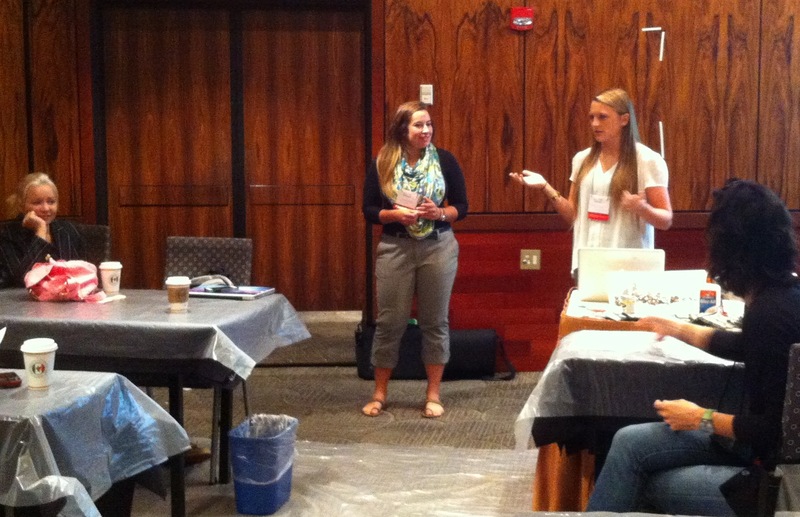 These students presented at the 2013 AENJ Conference in New Brunswick: Way to go, and keep up the great work! Ashley Garguilo! Ashley was awarded the 2013 AENJ College Student Scholarship. 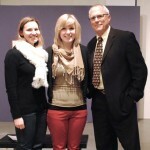 Kappa Pi Honor Society members for their exhibition opening “The Art of Teaching” at Grounds for Sculpture. The exhibit runs through November 3rd, 2013. 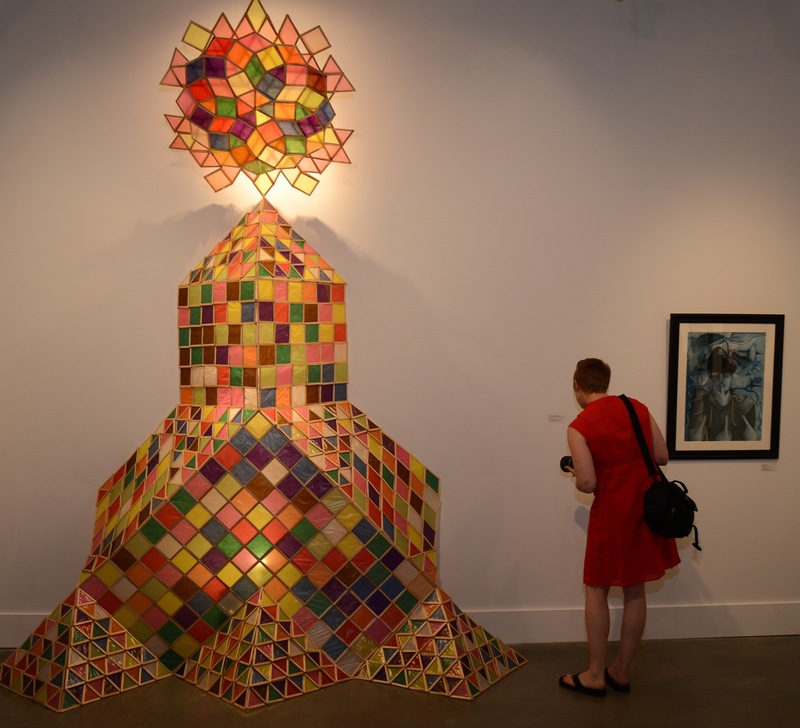 The artists in this exhibition seek to find the connection between the work they do as both artists and educators. 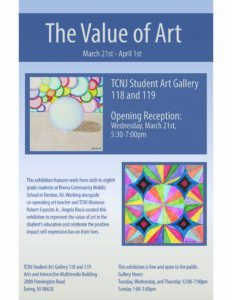 In addition to the twenty K-12 art students highlighted in the show from New Jersey and abroad, the four participating artists are TCNJ Art Education alumni and include: Kelsey Long, Matthew Pembleton, Anne Ruffner, and Danielle Sarnowski. Bryan Borut and Samantha Parlow for having been awarded a 2012 College Student Scholarship through Art Educators of New Jersey’s (AENJ). We are proud of your accomplishments and dedication to the arts and education! 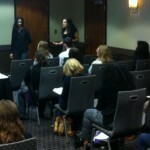 Matthew Pembleton and Kelsey Long for co-presenting with Professor LaJevic at the 2012 National Art Education Association (NAEA) Conference in New York City. The session titled, Exploring Contemporary Artists: Lesson Ideas for the Art Classroom, attracted many conference attendees and was a great success! All the K-12 students and art teachers who participated in TCNJ’s 2013 Art, Innovation, and Ideas,a statewide, juried K-12 student art exhibition! Krista Carpino (2015) teaches art at Northern Highlands Regional School District. Erin Chamberlin (2015) teaches art in South Brunswick School District. Caitlin Gold (2015) is an art teacher in the Princeton Public Schools. 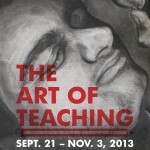 Scott Samuels (2015) teaches art in Hillsborough. 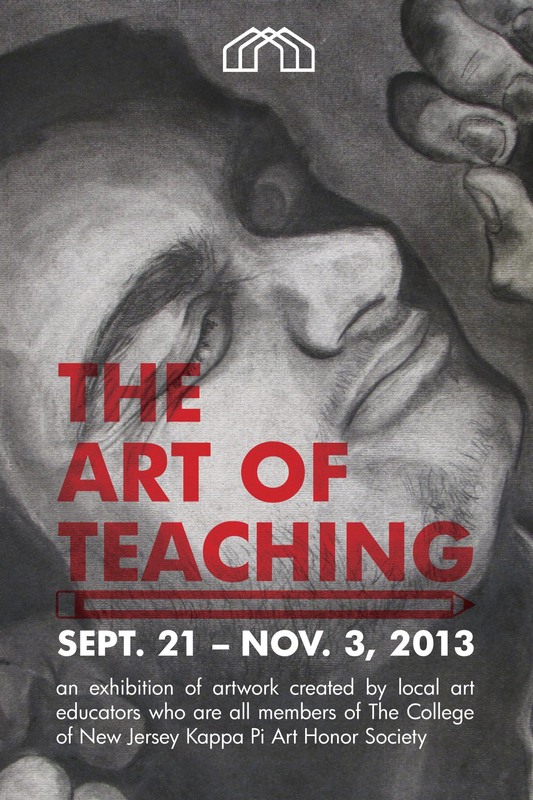 Samantha Berk (2014) is teaching middle school art in Cranford, NJ. Andrew Dean (2014) is an art teacher at Tuscan Elementary School in Maplewood NJ. 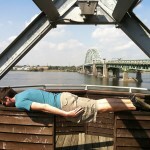 Johann Derflinger (2014) teaches art at Van Derveer School in Somerville, NJ. Ashley Garguilo (2014) is an art teacher at Rockingham Middle School, NC. Jessica Sassaman (2013) teaches art at North Falmouth Elementary School, MA. Keri Hamilton (2013) is an art teacher at Dutch Neck Elementary School in West Windsor-Plainsboro. 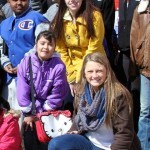 Samantha Parlow (2013) is working with Teach For America in Baltimore, MD. Lisa Czernikowski (2012) is an art teacher in Elizabeth School District. Valerie Gawron (2012) is teaching art at Matawan Aberdeen Middle School. 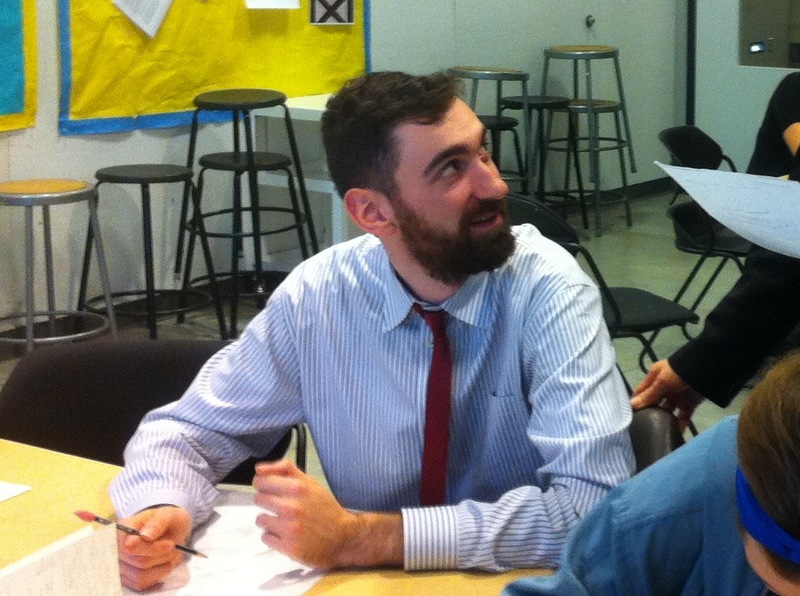 Kelsey Long (2012) is teaching art at Academic Charter School in Jersey City. Dana Sedlak (2012) is attending Rutgers graduate school to study Clinical Social Work where she plans to integrate the arts into her coursework. Jaimie Bass (2011) is an art teacher in the Summit School District. Julie Gallup (2011) received a first place ribbon for her photographic work at Sparta Camera Club in 2012. She has also shown her work at Gallery 14 in Hopewell, PA. She is employed at the Phoenix Center, a school for children with differing needs. Keith Kozak (2011) is an art teacher at Timber Creek Regional High School. Diana Montano (2011) interned at the Textile Museum in Washington DC. Katie Petrillo (2011) received her MFA in 2014 from Pennsylvania Academy of the Fine Arts and is working at the Philadelphia Museum of Art. Rachel Razza (2011) is an art teacher at Grover Cleveland Elementary School. 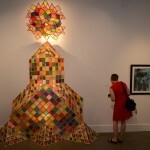 Anne Ruffner (2011) is teaching art at Edison High School. 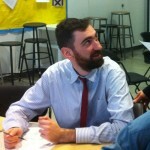 Jim Tramontano (2010) is teaching at Franklin High School.